The Rebel Sweetheart. 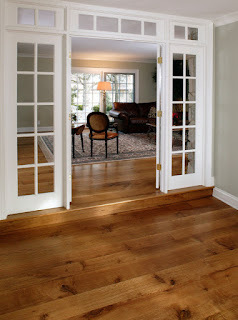 : Improving your home with oak hardwood flooring. Solid hardwood flooring such as oak is a great way both to improve your home and add value to it – two of the reasons it’s a popular choice. Solid oak flooring is a great choice for most homes – though there are some for whom it may be a more complicated option to install. The benefits are numerous: oak boards look great, they are totally unique, they add value to your home and they can even help lower your energy bills thanks to their insulating properties. However, before you make a final decision it’s worth thinking carefully about some of the different considerations involved. Stability. Solid oak boards can cup and warp when exposed to changes in temperature and humidity. Although you can address this up to a point, if you want to install oak hardwood flooring in a home that is prone to periodic dampness or has underfloor heating, for example, you may need some expert advice or additional work at installation to protect the boards and get around the problems involved. Cost. Oak hardwood boards can be costly due to the relative scarcity of renewable oak and processing time. Different widths and thicknesses of board will look and feel different, and will be more-or-less expensive. You may need to balance these factors when buying. Value. The flip side of this is the value they lend to your home. Although they may look similar, there is no question that solid hardwood flooring has greater appeal. Even if it’s largely sentimental, it’s unlikely that the alternatives will bring the same character and attractiveness to your house – and for you or for prospective buyers. Overseas or English oak flooring? As well as a financial cost, oak flooring can have an impact on the environment. The best companies will be roughly carbon neutral, sourcing English oak from forests around the country and planting new ones to replace the ones they use. In some cases trees may be imported from further afield – elsewhere in the British Isles or perhaps from the continent. However, there are companies which source oaks from America and around in the world – which comes with a much greater carbon cost. Knowing that their business relies on sustainable practices, many flooring companies deal with English oak from managed woodland and have a carefully thought-out environmental policy if they import from elsewhere. If this is not stated clearly on their website or in their promotional material, you can generally assume it is not a priority for them. One last factor to think about is the installation of your oak flooring. Part of the appeal of solid oak flooring is that the boards are totally unique. Due to the quirks of solid oak boards over other options, it takes longer to fit them – you will need to leave the planks for at least two weeks to acclimatise to the temperature and humidity of the room, and they are more complicated to work with. This means that they involve a far greater level of disruption and you may not be able to use a room for some time; you may also have to pay for an expert to do the job for you. On the other hand, once the process is complete you will be able to enjoy your new floor for decades to come.